It was such a gorgeous Sunday, so i decided to take the dog for an extended walk in a park near home. Yuki was thrilled of course, he managed to dirt himself from head to toe in aprox 5 mins. 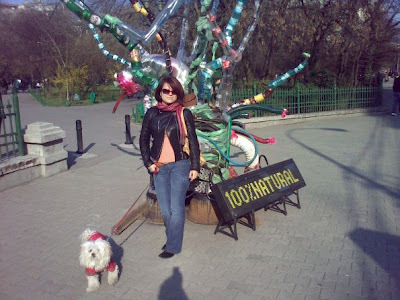 That's me and Yuki at the entrance, admiring somae strange statue, entitled "100% natural", part of a eco campagne in Bucharest.